Struggling to find that perfect birthday gift for a loved one? Looking for something theological to impress the new minister? Look no further and prepare for blessing as we introduce you to godly gadgetry. At last, hops go holistic  a beer that joyously ticks all those sanctified boxes. 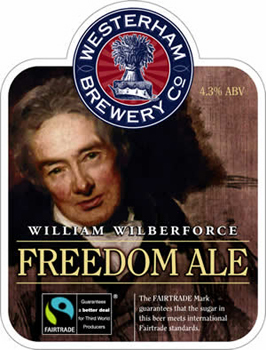 Proudly, Westerham Brewery in Kent, England, offers the William Wilberforce Freedom Ale. The anti-slave trade campaigner, subject of a new movie, began his long fight after a meeting at Prime Minister William Pitt's Holwood estate near Westerham. The pair talked under a tree that is now called The Wilberforce Oak. Described as "a deep mahogany ale characterised by its mellow bitterness and long hoppy finish," this new beverage comes from the kind of friend we all covet  a born-again brewer (note discreet fish symbol). And there's no need to spike one's social conscience, either. The William Wilberforce Freedom Ale is one of the few Fairtrade beers available on draught (sorry, south-east England only) and is made with demerara sugar from a smallholders' plantation in Malawi. "People trafficking is an illegal industry," Robert Wicks of Westerham Brewery told Ship of Fools, "and we will make a donation from the sales of this beer to the Stop the Traffik campaign." Set them up at Westerham Brewery. Holy Father Emeritus! Add some ex-infalliblity to your life with our B16 gadgets.